The Deputy Mayor for Education responded to our proposal for sanctuary schools in D.C. Teaching for Change staff and our allies agreed the response was inadequate. We acknowledged the response and will continue to discuss next steps with immigrant-led groups, students, educators, families, and advocates for sanctuary policies across the District. Continue to advocate for concrete sanctuary school policies within your school and to District officials. Some local officials and many of our education leaders recognize that the current resources that are being shared are not enough to support students or educators, particularly if ICE agents appear on school property. Share stories and information with officials, school leaders, and your networks, like the news that Chicago Public Schools ordered its principals to keep ICE agents out without a warrant and contact the CPS legal department. The policy mirrors a key component of our sanctuary proposal for D.C. schools that the Deputy Mayor for Education did not address. Continue to share the proposal and sample resolutions with school administrators directly in both traditional public schools and charter schools/LEAs. Charter schools can draft their own policies (see our proposal for charter schools), but some school leaders in D.C. and elsewhere are choosing to be proactive. For example, a DCPS school that partners with Teaching for Change recently informed staff and families of procedures to follow if ICE agents come to the school. The procedures closely follow our recommendations for DCPS, and include directing ICE agents to the front office while school leadership contacts DCPS Central Office. Another Teaching for Change partner school (DCPS) is in the process of establishing a committee to support immigrant students and families that will secure attorneys, support with legal fees and documents, and access community resources. In the current political climate in which the President is threatening to increase harassment of immigrants and deportations of undocumented immigrants, we must publicly demonstrate our commitment to all our students and families—especially those without legal documentation. Ask DC Public Schools and local education agencies (LEAs/charter schools) operating within the District of Columbia to stand as sanctuary schools/safe zones. Sign on below. 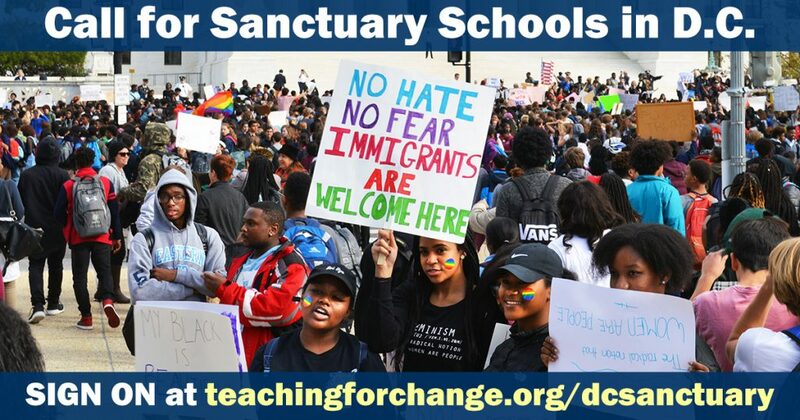 On February 14, 2017, Teaching for Change, whose constituents include D.C. educators and immigrant families, sent a proposal addressed to Mayor Muriel Bowser, Deputy Mayor for Education Jennifer Niles, and other D.C. officials requesting that DC Public Schools and LEAs adopt sanctuary/safe zone policies. The letter includes proposed resolutions for both sectors with language adapted from the National Education Association that was reviewed by the Washington Lawyers’ Committee for Civil Rights and Urban Affairs. Special thanks to Amrita Wassan, a D.C. high school teacher, and Cathy Reilly of S.H.A.P.P.E. and the Coalition for DC Public Schools and Communities (C4DC), who contributed to the proposal. This effort was informed by SMART members of Many Languages One Voice (MLOV), a youth-led advocacy and organizing body in D.C., who will continue to press for a full ban of ICE from schools and other locations in which immigrants may be targeted. We requested a public response from the Deputy Mayor for Education by February 24, 2017. Sign on below. If you and/or your organization would like to sign on in support of this request for robust sanctuary/safe zone policies for DC Public Schools and charters, please add your information below. Each charter school/LEA can adopt this resolution. Email ts@teachingforchange.org to request MS Word versions of the documents. See the list of individuals and organizations who have signed onto the letter here.